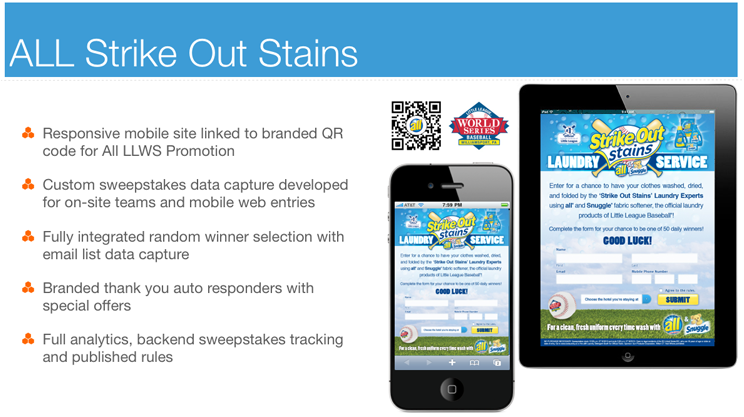 All and Snuggle brands wanted to strike out stains at the Little League World Series. ApolloBravo developed this responsive promotion landing page and with consumer data capture and built-in random winner selection. Promotion teams with iPads interacted with consumers and captured entries for the contest which included hundreds of winners for free hotel laundry service from All and Snuggle. Consumers could also access the entry site on mobile devices via a branded QR code, capturing additional entries at the event. The program also included winner notification, sweepstakes rules and full reporting / analytics.